Jason Angell at Longhaul Farm in the Hudson Valley, New York. Credit: Theo Angell. All rights reserved. For most of my life I‘ve been a political activist, believing the story that social transformation comes through radical legislation pushed along by brave elected leaders. I once imagined becoming one of those leaders myself, and had a mental picture of giving a speech to a massive group of people in what looked like the National Mall in Washington DC. I know I inherited that picture from my father, who harbored dreams of being a politician who had something true to say to people that would lead them out of the wilderness. He ran for Congress in 1972 unsuccessfully in the same community where I now live and have a farm, but my path to becoming a farmer was unexpected, paved by three experiences that challenged my belief that the change I hoped to see in the world could be won through the current political system. The first was a brief run for the New York State Senate in my early thirties in the Hudson Valley. Most of my days were spent alone, calling people to ask for money which I dreaded. Sometimes I would stand in front of civic groups, introduce myself, and tell them why I had the answers (which I didn’t). So I dropped out. Eventually I got a job as Director of the Center for Working Families—a think-tank allied to the Working Families Party (WFP) and a place where ideas could be translated into direct action through the Party’s political muscle. It was 2009 and New York State faced one of the largest budget deficits in the country. The old debate raged on: increase taxes or cut public services drastically? This was a fight I wanted to be a part of. I still remembered the visceral wrongness of walking by homeless people on frigid winter streets when I moved to New York City as a kid in 1986. Now Manhattan was the playground of the world’s wealthy elite—bankers and hedge fund managers bringing home bonus check millions while the economy collapsed under the weight of their subprime mortgage lending greed. My job was to design a tax reform proposal to increase taxes on the wealthiest New Yorkers, which had been slashed for decades. Progressives united around the cause—teacher and healthcare unions, poor people’s organizations, private foundations, (some) Democrats and WFP legislators—and the “Millionaire’s Tax” became law. But in the aftermath of this victory I grew increasingly skeptical. The tax reform was won on the argument that putting a few hundred dollars in people’s pockets was better for economic growth than cutting public services. But what about putting capitalism’s unregulated greed on trial or questioning the spiritual damage of living in a culture that maintains money should remain our highest aspiration? Things were changing on the surface but not deep down. As a third party in New York (and active in 17 other states), the WFP organizes to drag the Democratic Party left by organizing progressive voters in close elections. It’s good at what it does, using the remaining power of organized labor to place working people’s issues on the agenda. But at the end of the day, it is still very much a creature of the political system, often constrained by the narrow agendas of its most powerful union leaders and more dedicated to winning a seat at the table where political decisions are made than democratizing decision-making so that regular people have more power. As I came into the office everyday to craft more powerpoints and papers, was I happy or fulfilled or convinced that any of this would lead to transformation? Life in the city was expensive, so both I and my partner Jocelyn had to work full-time. The city was pushing us towards a way of living that seemed to be just as much a part of the problems I hoped to solve through new policies and laws. Cracks began to appear in the first story I had told myself about how change is accomplished, and I didn’t have another to replace it. A year after that blank page moment we quit our jobs and moved to Argentina. I had to imagine a new story of life and needed as much space as possible to create it. We moved to El Hoyo, a small rural town in Patagonia a friend had traveled through years ago and rented a small cottage on a farm called Chacra Millalen, run sustainably by a family for 20 years. Our mornings were spent thinking, writing, and exploring what was most important to us and in the afternoons we worked in the garden and learned how to farm. I had grown up privileged, never really doing much physical labor, and I found that the balance of the mental and the physical left me more content at the end of the day than I had ever been before. Living in El Hoyo exposed us to a much larger sense of community than any we had experienced in New York. We were eating and cooking together. A lot of neighbors bartered, trading vegetables for having a car fixed for example. Large jobs like hauling wood for the winter were collective and people relied on each other more. Everything was treated as invaluable, so was cooked, canned, preserved, fixed and sharpened until the bitter end. One day we woke up and realized that we had built a new story of a life for ourselves, one that involved farming and trying to build the same kind of communities back home. We realized that the first step to building a new world is to start living it. 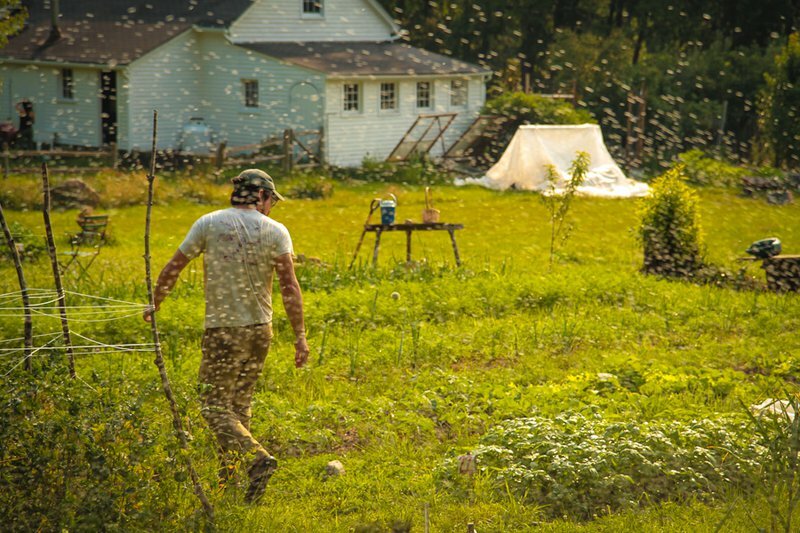 So we moved back to the Hudson Valley and started Longhaul Farm and the Ecological Citizen’s Project to create spaces, programs and podcasts through which people can learn about ways of life that are built around different values and routines than those offered by mainstream America. But we didn’t want to repeat the same mistakes we saw in the ‘back to the land’ and earlier Utopianist movements, which became islands of personal improvement and perfect community creation cut off from larger political work required to transform society. It’s very difficult to sustain a countercultural personal life in a society that doesn’t value that kind of life nor is built to support it. Farming at our scale doesn’t pay all the bills or provide benefits. Eventually, we were able to find flexible teaching work that allowed us to share child care duties, get our healthcare through a mix of work-based and state programs, and reduce our housing costs through a farming tax credit. Transformation requires that we both pioneer new personal ways of life while also working together to enact policies and build new social institutions that will sustain them. I’ve begun to reconsider the old picture that I had in my head, the one where I’m delivering the speech on the Mall. I’ve realized that a lot of that dream came from my ego, which is a barrier to greater progress. Our culture celebrates the greatness of the individual—celebrities, business icons and agents of social change—without acknowledging the collectives around them that are the true source of greatness. We’ve built a political industrial complex made up of candidates, political operatives, lobbyists and think tankers that keep people far from the privileged places of decision-making. It’s no wonder that what the majority of people want doesn’t really matter if it runs counter to moneyed interests. Conventional politics treats citizens largely as consumers, whose only power is to vote for the best person to represent them from a field of candidates culled by donors. Since campaigns follow a zero-sum dynamic that leads candidates to tear down all their competitor’s ideas and magnify their negatives in the pursuit of winning office, the bitter partisan divide grows ever wider. Who really believes that the problems we face can be addressed by selecting the right candidate in this kind of system? To bridge the divide between our personal and political lives we need to build new democratic norms and institutions that abandon the ego-driven ‘great individual’ model and allow mass participation in coming up with solutions, while also demanding that we enact them in our own lives. Over the past year, we’ve tried to do this by conducting a local experiment in the Town of Philipstown called the Community Congress. We asked any resident to answer the question, “What’s your idea for preserving and promoting a strong community?” Over the course of three public forums, residents proposed 40 ideas across a range of issues. Then we invited all Philipstown residents age 13 years and older to name their top three priorities through an online and mail-in ballot. Over 750 residents voted, and even more hopefully 450 identified themselves as willing volunteers to roll up their sleeves and get to work turning the priorities they voted for into reality. In the next few years we’ll begin the work of building other Community Congresses throughout the Hudson Valley, forging a more people-centered democracy to build the world that people want. I realize now that the path to social transformation is not a binary choice between personal or political change. We must live our political values within the daily routines of our personal lives and grow a new kind of politics that’s grounded in a higher quality of human relationships—unafraid of asking much more of us than our votes.